The Blankenberge ON0BL ATV-DATV-Repeater station is a project made and realized by Peter PREEM (ON1AJX) and Alain WYBO (ON7ATV). 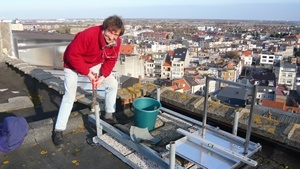 A few years ago Peter had an ATV-Repeater station (ON0OS) in Ostend. 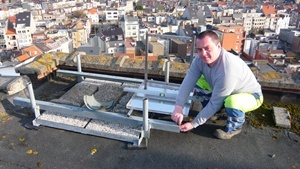 After more than 3 years of inactivity, Peter took the idea, together with Alain, to restart with the making of an ATV-DATV-station now in his native town of Blankenberge. From April 2009 the 3th, the 3cm ATV-Repeater is working on 10260.000 MHz with a power of 10 Watt. On July 2009 the 10th, the 23cm DATV-Repeater started to transmit digitally on 1293.750 MHz with a power of 20 Watt. The project is going further : The ON0BL Repeaterstation is designed to be operational with 4 digitally encoded streams, from witch 3 encoded in Mpeg 2 SD on 625i lines and 1 encoded in Mpeg 4 (H264) HD on 1080i lines. Those streams will be transmitted simultaneasly, as on a frequency around 10260 MHz as on 5735 MHz. The now operational antennas, we did freeze them with the help of Mr Michel Cardon (1293.750MHz) and also with the help of Mr Robert Dewilde (10260Mhz). 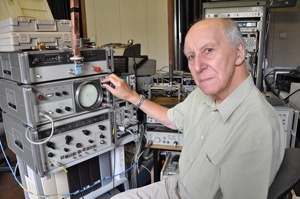 We wish to thank Mr Willy Van Marck (ON4RT) for his work in measuring the antennas and the transmitted spectrum. 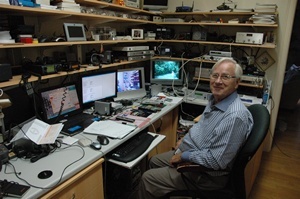 We are also gratefull to Mr Arthur Lambriex (ON5FIN) for his job in adapting the software of the digital encoders. The help from Mr Edmond Blereau in the realisation of our project was very important to us and this is something we do appreciate very much. After 30 min the logic automaticely switches off and a testscreen is displayed continuesly since the TWT is working 24h/24h.